If you looking to buy a new Subaru WRX STI you may want to wait. Is Subaru coming out with a more powerful new engine in the WRX STI? Subaru is upgrading their entire engine lineup and that will include the new WRX STI. Performance enthusiasts should see a new engine in the WRX STI in the next few years. Will it come with hybrid technology? It’s just speculation at this point but it could in the future. What is coming is an updated turbo engine for the U.S. market. If you are thinking of buying a new 2016 WRX STI, you may want to wait. Subaru has rolled out their “Prominence 2020” vision and it will include a new plug-in hybrid for the U.S. market by 2018 and a new seven seat Crossover. Subaru will also overhaul its existing boxer engine lineup by 2020. Subaru kept the old 2.5-liter Boxer engine in the 2015 WRX STI for the global market, but chances are it will get a new 2.0-liter engine. The new-generation WRX STI’s current 2.5-liter powerplant needs to be upgraded. Subaru launched the WRX S4 with a new “smarter” engine in Japan first, and then introduced it later to other world markets in the WRX and WRX STI in Japan. The Japan-market STI is powered by a 2.0-liter turbo boxer engine that produces 304hp and 311 lb ft of torque. The new Japan-only WRX STI S207 uses the same engine that’s tuned to get a maximum power output to 328 PS (323hp). STI won the Nurburgring 24-hour race with this engine and it’s proven to be a great engine. It’s a better engine than the production 2.5-liter the new 2016 WRX STI comes with in all other global models. Japan’s current 2015 WRX STI 2.0-liter boxer uses a combination of direct injection, high compression (10.6:1), Subaru Dual Active Valve Control System (D-AVCS), a twin-scroll turbocharger and an intercooler to get improved performance. 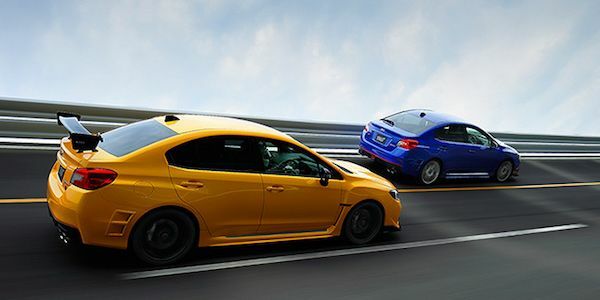 The WRX STI Nurburgring race version uses different cams and higher-rate valve springs and other enhancements to enhance the performance envelope. Subaru Tecnica International is pushing the performance envelope with engines and chassis technology. It’s good thing because Subaru will need to compete with challengers like the 345hp Ford Focus RS that will hit U.S. shores next year. If you are thinking of buying a new 2016 WRX STI, you might want to wait. Look for the Japanese automaker to upgrade the new STI with a more powerful, more efficient 2.0-liter engine soon. The will have to sell the S207 STI in the US just to compete with Focus RS, but I'm hoping that they will push it to at least 350+ bhp and 350+ lb/ft tq to stay competitive. Bought a 2016, I don't regret it. Very fun car! well, lots of opinions out there... you must not be very realistic in regards to engine production and marketing, but you must understand that first issue if a new engine is sort of experimental (sort of imoral but this is the market today) and nearly every producer encounters failures on newly launched engines. I work in the field, and by my rationality, I believe the recomended engine would be the last edition in production of a certain series of engines. I bought the 2015 sti, and to presume it is old technology would be ingnorant. You must see the fact that they have significantly improved the engine on level that are not commonly comprehensive for the wide "audiance", so just looking at the basic technical specifications and judge they level of technology they used in it is just plain dumb. Take into account that they have also added this engine to their flagshop, Mr., and by my accounts you do need to sharpen your aurtomotive knowledge. And if you suggest that the 2.0 litre Japan based STI was added to the car due to the fact that it is better, then you are getting further and further of the truth. These are just decisions taken by the producer to basiclly addapt the vehicle for different markets, such as for example in Japan, the taxes are bassed on CO emissions in relation to the cubic capacity, which if they used the 2.5, sales would have hit an already sales crippled producer. So, start LEARNING before you suggest wrong advice and info to the open public. These cars are fun and very capable but I think Subaru really needs to get with the times. You can get an Audi S4 for the price of a STi S207 snd on top of it have superior quality components inside and out. I was thinking of a 2017 STi but when I think of it, I know Im just going to be disappointing, yet again, by " Subaru's cutting of corners. And for the $ , its not worth it. No wonder the baby brother WRX is destroying the Sti in sales. its way cheaper and just as nic "Ooh I dont get to change the differential settings" you say blah blah blah Thats for track use 1 in a zillion people who own Sti's track it. Subaru!, make your flagship sport sedan flagship again and no more than $8k over the WRX ,fully loaded and watch them sell like hotcakes. You can get an Audi S4 for the same price of an STI s207? Really Well I can't buy one in Australia as they don't sell them. Only the STI and STI Limited are available. Have you looked at the servicing costs involved in owning an Audi S4? lols it's ridiculous and so are the prices on the parts unlike an affordable road/rally car. For those that think there's not enough power you can spent $3500 and you will have 325hp and if you want more power strengthen the internals and get a larger turbo coupled with a bigger intercooler and you will have about 350+ hp so power isn't the issue for 90% of the purchasers as for the most part 30% of the STI's performance cannot be utilized on the road because you would kill yourself if you did. Yup, that's exactly what Imy doing and I love having mine now! The s207 engine is an EJ series engine like the current STi EJ257. The S4 WRX has a 296h.p. FA2.0 engine but it does not come with a manual transmission. Rumors say the new STi will be a hybrid producing 321 h.p. using an FA2.0 engine with a dual-clutch gearbox. Those wanting an engine upgrade in the next generation of the STi will get it, but probably at the loss of the manual transmission. Subaru doesn't have to worry about the Ford Focus RS. In fact, if Subaru wanted to, they can design a faster and more powerful STi that can blow the RS out of the waters. Subaru is not about power, it's about balance. Having a well balanced STi can be really dangerous when adding a pro driver behind the wheel of an STi. Subaru nailed the production of the STi. Ford after many years designs and builds a car that finally hit a 0-60 record in 2016 that the STi and Evo did back in 2004. Subaru has a very reliable AND holds amazing value. The 2017 Subaru WRX STI still is 305HP 2.5L turbo. No change for what, 12 years? They need to get hybrid technology in there.